The Caribbean low-level jet (CLLJ) is an important component of the atmospheric circulation over the Intra-Americas Sea (IAS) which impacts the weather and climate both locally and remotely. It influences the rainfall variability in the Caribbean, Central America, northern South America, the tropical Pacific and the continental Unites States through the transport of moisture. We make use of high-resolution coupled and uncoupled models from the Geophysical Fluid Dynamics Laboratory (GFDL) to investigate the simulation of the CLLJ and its teleconnections and further compare with low-resolution models. The high-resolution coupled model FLOR shows improvements in the simulation of the CLLJ and its teleconnections with rainfall and SST over the IAS compared to the low-resolution coupled model CM2.1. The CLLJ is better represented in uncoupled models (AM2.1 and AM2.5) forced with observed sea-surface temperatures (SSTs), emphasizing the role of SSTs in the simulation of the CLLJ. Further, we determine the forecast skill for observed rainfall using both high- and low-resolution predictions of rainfall and SSTs for the July–August–September season. We determine the role of statistical correction of model biases, coupling and horizontal resolution on the forecast skill. Statistical correction dramatically improves area-averaged forecast skill. But the analysis of spatial distribution in skill indicates that the improvement in skill after statistical correction is region dependent. Forecast skill is sensitive to coupling in parts of the Caribbean, Central and northern South America, and it is mostly insensitive over North America. Comparison of forecast skill between high and low-resolution coupled models does not show any dramatic difference. However, uncoupled models show improvement in the area-averaged skill in the high-resolution atmospheric model compared to lower resolution model. Understanding and improving the forecast skill over the IAS has important implications for highly vulnerable nations in the region. The Intra-Americas region, also known as the Intra-Americas Sea (IAS), is defined as a broad area including the Gulf of Mexico, southern United States, Mexico, the Caribbean Sea with its islands, northern South America, Central America and the ocean off the west coast of Central America and Colombia (IASCLIP 2005). The most important physical mechanisms controlling the rainfall in the region are associated with the semi-annual strengthening and westward excursion of the North Atlantic Subtropical High (NASH; Wang 2007a), and its relationship with the variability of the Atlantic side of the Western Hemisphere Warm Pool (WHWP; Wang and Enfield 2001, 2003), cold surges emanating from the North America (Schultz et al. 1997, 1998), annual migration of the ITCZ (Hastenrath 2002; Higgins and Shi 2001; Hu and Feng 2002; Nogues-Paegle and Mo 2002) and the Caribbean Low Level Jet (CLLJ; Amador 1998, 2008; Amador and Magana 1999; Mo et al. 2005; Wang 2007a). NASH’s zonal migrations in summer and winter modify both the surface-level pressure (SLP), winds and thus sea-surface temperature (SST) gradients (via wind-evaporation-SST feedback) in the Caribbean, being associated with well defined bands of strong easterly winds and SST gradients, which are maximum in the July–September (JAS) season (Wang 2007a). These further induce the horizontal SLP gradients that force the low-level atmospheric winds and produce the CLLJ, which is one of causes for the CLLJ formation. Furthermore, an important positive atmosphere–ocean feedback mechanism has been suggested that helps self-sustain the CLLJ: the easterly winds induce positive and negative wind stress curls to the north and the south of the jet, respectively, that further increase the SST gradient through oceanic Ekman dynamics warming the WHWP via downwelling, and cooling the southern part of the Caribbean via upwelling (Inoue et al. 2002; Wang 2007a). Thus, the CLLJ can be considered a central climate driver for the Intra-Americas, sensitive to the variability of NASH, WHWP and to SST patterns in both the Pacific and the Atlantic (Amador 2008; Krishnamurthy et al. 2015). In consequence, we pay special attention to the CLLJ in this work. The seasonal evolution of rainfall in the Intra-Americas region varies based on the geographical location. For example, in the Central America, there is a pronounced difference in the seasonality of rainfall between the Pacific and the Caribbean coasts, mainly attributed to the interaction of the dominant easterly winds with the local topography (Taylor and Alfaro 2005; Maldonado et al. 2016a; Magaña et al. 1999). In addition, several regions in the Intra-Americas, such as southern Mexico, Central America and Caribbean exhibit a bimodal distribution of rainfall that correlates well with the semi-annual variability of the CLLJ (Magaña et al. 1999; Amador 2008). The precipitation peaks before and after the Mid-Summer Drought (MSD) in July, when the easterly winds are at their maximum intensity on the Pacific slope of Central America (Magaña et al. 1999). In addition to contribution of the Choco jet from the Pacific side (Poveda and Mesa 2000, Durán-Quesada et al. 2010), rainfall is seasonally modulated by the Caribbean low-level jet from the Caribbean side via its control of moisture advection, vertical wind shear and easterly waves (Amador 1998, 2008; Amador and Magana 1999; Wang 2007a; Durán-Quesada et al. 2010; Maldonado et al. 2016a). Further, the region of intense precipitation maxima near Costa Rica and Nicaragua in the southwestern Caribbean region during July and the low-level convergence–divergence patterns are suggested to be strongly associated with large-scale CLLJ dynamics (Amador 2008). It is expected that models that have a fair representation of the CLLJ characteristics also have a better representation of the rainfall characteristics for most of the Intra-Americas. As mentioned before, atmosphere–ocean feedback is an important driver of the CLLJ, and hence it is important for climate models to have accurate representation of the feedback mechanisms between the atmosphere and ocean. The state-of-the-art coupled global models have been shown to have important biases leading to misrepresentation of the rainfall variability in the region (Ryu and Hayhoe 2014), while global atmospheric models forced with observed SSTs have a better representation of the CLLJ characteristics and associated rainfall (Martin and Schumacher 2011; Diro et al. 2012) although these studies suggest a slight underestimation of magnitude of the CLLJ. However, it is logical to think that coupled models will have an accurate representation of the involved key physical processes related to air-sea feedback than uncoupled models. This contradiction between the perceived notion about coupled models and previous studies which indicate that the uncoupled models are better, motivates us to have a comparative study for the region between the coupled and uncoupled models. Studies based on Coupled Model Intercomparison Project Phase 3 (CMIP3; Martin and Schumacher 2011) models reveal that most of the state-of-the-art coarse resolution coupled models fail to capture the correct magnitude of the CLLJ, its semiannual cycle and associated rainfall. Their CMIP3 study suggests the need for high-resolution models to precisely simulate the mean state and variability of the CLLJ, and to further capture the local small-scale relationships between the jet in the IAS and the surrounding regions. Muñoz et al. (2008) suggest that the surface temperature and orographic effects also contribute to the strength of the CLLJ, in agreement with Wang (2007a). However, Maldonado et al. 2016a suggests that topography may not have influence on the simulation of the CLLJ. They note that this result needs to be treated with caution due to instability issues. Further model sensitive studies and those with higher resolution (higher than 80 km as used in Maldonado et al. 2016a) may be needed to support above hypothesis. The low-level jet, while transporting moisture to the surrounding inhabited continents, encounters orographic influences on its path such as Greater Antilles and mountains of the northern South America which confines the jet structure and the mountain range of the Central America on the western side of the Caribbean. Thus, high-resolution coupled models with accurate representation of orography may be required for a precise simulation of the structure and strength of CLLJ. The highest atmospheric resolution used so far to study the CLLJ is 1.125° (Martin and Schumacher 2011), although other studies have used higher resolution to understand different aspects of IAS such as representation of SSTs, ocean currents and heat flux with changing bathymetry (Misra et al. 2016). In this study, we use the Geophysical Fluid Dynamics Laboratory (GFDL) Forecast-oriented Low Ocean Resolution (FLOR) model which has a high-resolution atmospheric component at approximately 50 km (0.5° × 0.5°), and the low-resolution GFDL Coupled Model version 2.1 (CM2.1) at approximately 111 km (1° × 1°) to understand the climatological structure and seasonal cycle of the CLLJ, as well as its variability and associated teleconnections. We also compare with uncoupled simulations of FLOR and CM2.1, referred to as AM2.5 and AM2.1, respectively. Further, we also assess the skill of these coupled and uncoupled models in predicting rainfall over the Intra-Americas Seas. Most common seasonal prediction schemes used in Central America, northern South America and the Caribbean employ statistical models based on empirical relationships between predictors like observed sea-surface temperature (SST) and rainfall. For example, the Central American Climate Outlook Forum (CACOF) uses this approach to provide accumulated rainfall forecasts for the May–June–July (MJJ), August–September–October (ASO) and December–January–February–March (DJFM) seasons (García-Solera and Ramírez 2012; Alfaro et al. 2017). A number of studies (Alfaro 2007; Fallas-López and Alfaro 2012a, b; Maldonado et al. 2013, 2016a, b) has analyzed the predictability of rainfall at seasonal timescale using cross-validated statistical forecasts based on the observed tropical Atlantic and Pacific SST anomalies with a lead time ranging from a month to a season. Using several kind of metrics, these studies show that the predictive skill is high enough as to be of potential use for the development of climate services (Vaughan and Dessai 2014) over a large portion of Central America. On the other hand, since 2008, the Latin American Observatory for Climate Events (http://ole2.org; Muñoz et al. 2010, 2012) has been issuing high-resolution regional-scale seasonal forecasts for different variables relevant to climate services. 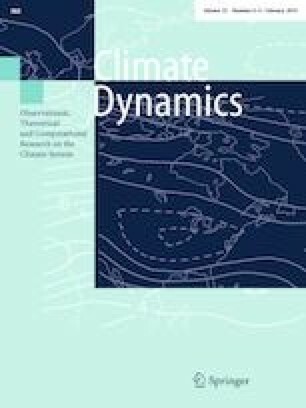 Although originally their approach used a multi-physics dynamical downscaling with a combination of regional climate models (Muñoz et al. 2010), the Observatory has more recently migrated to predictions of “seasonal scenarios” computed using the same kind of SST-based statistical models mentioned above, and Model Output Statistics (MOS) applied on the Climate Forecast System version 2 (CFSv2) ensemble-mean rainfall predictions. The skill assessment for both types of seasonal scenarios, using a variety of metrics, is publicly available on the Observatory’s Datoteca (Chourio 2016; see also details in http://datoteca.ole2.org/maproom/Sala_de_Validacion/index.html.es). In terms of accumulated rainfall predictive skill, the Observatory reports values of the spatially averaged Kendall’s tau correlation coefficient that range from 0.040 (March–May, or MAM) to 0.180 (OND).1 Thus, so far, either statistical models, regional models and/or coupled dynamical model with resolution up to 1° x 1° have been used for seasonal prediction of rainfall over the IAS. To the best of the author’s knowledge, this is the first study for this region that assesses the rainfall predictive skill using high-resolution global coupled models with a statistical correction to account for biases in the model variables in the context of seasonal prediction. Alfaro et al. (2017) have applied similar statistical correction over Central America. The rest of the paper is organized as follows. Section 2 presents observational datasets, models and model data, as well as the methods of analysis used in this research. The main results are discussed in Sect. 3 and the concluding remarks are stated in Sect. 4. The high-resolution reanalysis data on 0.5° × 0.5° in longitude by latitude for sea-level pressure, and for zonal and meridional winds are obtained from NASA’s (National Aeronautics and Space Administration) Modern-Era Retrospective Analysis for Research and Applications (MERRA), for the period 1979–2012 (Rienecker et al. 2011). The MERRA was generated using the Goddard Earth Observing System version 5.0 and its data assimilation system. The zonal and meridional winds are available at 42 vertical levels from 1000 to 0.1 hPa. The monthly SST data is derived from HadISST1.1 version from the Hadley Centre for Climate Prediction and Research. It spans for the period 1870–2012 on 1° × 1° grid (Rayner et al. 2003). Two independent rainfall datasets are used in this study. One is the Climate Prediction Center (CPC) Merged Precipitation analysis (CMAP) provided by the NOAA/OAR/ESRL PSD, Boulder, Colorado, USA, available at their web site (http://www.esrl.noaa.gov/psd/). This is a merged precipitation dataset derived from the combination of gauge measurements, satellite observations and National Center for Ensemble Prediction (NCEP)—National Center for Atmospheric Research (NCAR) reanalysis (Xie and Arkin 1997). It is known to have better quality than the individual estimates. The data is available on 2.5° × 2.5° grid, and for the period 1979–2013. The second dataset is the East Anglia University’s Climate Research Unit product known as CRUTS3.23 (Harris and Jones 2015), that uses surface rainfall gauges and state-of-the-art-interpolation methods to build a gridded precipitation dataset at a horizontal resolution of 0.5° × 0.5° and for the period 1979–2012. As indicated in the Introduction, the models used in this study are CM2.1 and FLOR, a modified version of Climate Model version 2.5 (CM2.5). The CM2.1, CM2.5 and FLOR models are described in detail in Delworth et al. (2006), Delworth et al. (2012) and Vecchi et al. (2014), respectively. The physics is similar in both the atmospheric component of the models, the main difference being associated with the horizontal resolution. CM2.1 comprises of Atmospheric Model version 2 (AM2) which has a resolution of approximately 200 km, and has 24 vertical levels. The oceanic component is the Ocean Model version 3.1 (OM3.1), with 1° × 1° horizontal resolution and 50 vertical levels. FLOR includes the same atmospheric component as CM2.5, but the oceanic component is from CM2.1. The atmospheric component of FLOR is on a 0.5° × 0.5° longitude by latitude grid, with 32 levels in vertical. The mean state and variability of the upper surface variables (such as rainfall, SST, SLP and the upper and lower-level zonal and meridional winds) in FLOR is very similar to that of CM2.5 (Jia et al. 2015). Thus, we focus on FLOR for the rest of this analysis. FLOR is shown to have better climate simulation than CM2.1 which further leads to improved simulation of teleconnections and predictions (Vecchi et al. 2014; Jia et al. 2015; Yang et al. 2015; Krishnamurthy et al. 2015, 2016, 2018; Zhang and Delworth 2015). All the results presented in Sect. 3.1, have been verified with the CM2.5 simulation and they yield similar results, suggesting that the increased ocean resolution plays a secondary role. The 1990 control simulations of CM2.1 and FLOR are used in this study, where the greenhouse gases, aerosols and solar forcing are prescribed at 1990 levels. The CM2.1 and FLOR simulations span from year 101–300 and year 601–1200, respectively, to avoid spin-up issues. We analyze these runs to investigate the ability of the models to simulate CLLJ, its impacts and relationship to large-scale SST forcing. Further, we use forecast runs from CM2.1 and FLOR model to asses the forecast skill of the models in predicting rainfall patterns during July-August-September (JAS) that may be driven by CLLJ. We analyze the forecast runs starting from 1981 to 2013, with initial conditions starting from June 1st. Due to uncertainties associated with boundary and initial conditions, inadequate representation of physical processes and the chaotic nature of the climate system, models always exhibit errors. Part of these errors, the systematic ones, can be corrected via a statistical approach generally known as Model Output Statistics (MOS; Glahn and Lowry 1972; Wilks 2006). In this work, Canonical Correlation Analysis (Barnston and Ropelewski 1992; Wilks 2006), or CCA, is used as MOS to correct the biases in the model output. In brief, CCA identifies modes of variability by maximizing the correlation between linear combinations of predictor and predictand empirical orthogonal functions (EOFs). CCA is a common statistical method frequently used to forecast rainfall using a purely empirical approach (Mason and Baddour 2008; Barnston et al. 2012), especially in developing countries and in particular in the Intra-Americas nations. For example, considering 30 years of data,2 if the predictor field is observed SST of the previous month to be forecast (e.g., June), and the predictand is the observed rainfall for the season to be forecast (e.g., July–September), CCA can be used to build a statistical model to predict the behavior of certain linear combinations of the observed rainfall EOFs in terms of linear combinations of the June sea-surface temperature EOFs. In a MOS approach, the predictand, or variable to be forecast, is still the observed rainfall for the season of interest, and the predictor is the raw model output rainfall for the same season. CCA in this case corrects both biases in the magnitude and in the spatial location of the modeled precipitation patterns. In this work, CCA is applied to both model rainfall (over the domain 4°S–33°N, 120°W–50°W) and SST fields, and for the JAS season. MOS correction is applied for every grid point. This work uses a 5-year-out cross-validation window, meaning that when “training” the CCA model, five continuous years are purposely left out of the record. Further, the regression coefficients are computed with the remaining time series, and the resulting model is validated by comparing the prediction’s the third year (the middle year in the 5-year out window) against observations. The 5-year-long window is redefined a year at a time, thus moving from the beginning of the record to its end. The mean value of the validation metric computed for each iteration is reported as the cross-validated goodness-of-fit index. The Kendall’s tau rank correlation coefficient is used in this work as an overall metric for assessing rainfall skill (the goodness index). A negative Kendall’s tau means that the forecast is worse than using climatology, while a value of one corresponds to a perfect set of forecasts. The values are computed for each gridbox and then spatially averaged in order to have an overall assessment of skill. The Generalized Relative Operating Characteristics (GROC), also called 2AFC score (2AFC = (tau + 1)/2; Mason and Weigel 2009), is used to evaluate precipitation skill at a local scale, i.e., via spatial maps. A value of 50% corresponds to climatological values, and thus regions with a 2AFC lower than 50% are worse than the climatology. A value of 100% indicates perfect discrimination. This score is similar to Kendall’s tau, and measures the “proportion of all available pairs of observations of differing category whose probability forecasts are discriminated in the correct direction” (Mason and Weigel 2009). It has an intuitive interpretation, as an indication of how often the forecasts are correct. The CLLJ is considered to be predominantly zonal and is known to have maximum wind speeds in the Caribbean region defined by the domain 70°W–80°W and 12°N–16°N (Muñoz et al. 2008; Wang 2007a; Whyte et al. 2008). The vertical profile of the CLLJ is defined in terms of area-averaged climatological zonal winds for the Caribbean region, to examine its structure and seasonality (Fig. 1). The observed vertical structure in Fig. 1a indicates peak values of zonal wind at 925 hPa during winter and summer, with the wind speeds being strongest in July. In addition to the strengthening of winds in July, the jet structure also deepens vertically. The minimum in the low-level jet occurs in May and October. The CM2.1 model shows the summer peak in June and weakens much earlier compared to observations, failing to capture the July peak and the minimum in May (Fig. 1b). Figure 1f shows that the high-resolution model FLOR successfully captures the summer peak in July and vertical deepening of the jet (only with a difference of slight deepening beyond 650 hPa, compared to observations). This is an important improvement in the representation of CLLJ peak in summer over CM2.1. The representation of CLLJ is better in AM2.1 and AM2.5 compared to their coupled counterparts. This highlights the role of SSTs on the adequate simulation of the CLLJ. AMIP runs have SSTs close to observations, and hence may lead to improved simulation of the CLLJ. The vertical structure of zonal wind in the Caribbean region suggests a peak at 925 hPa level in the observations that is successfully simulated by both CM2.1 and FLOR. Thus, in the following, we focus on that level and define the time series of climatological CLLJ at 925 hPa for both observations and models (Fig. 1b). The observed time series shows a semiannual cycle with peaks in January and July, and minimum in May and October (Fig. 1b). Similar to the vertical profile, the time series also shows that the FLOR model captures the summer peak accurately in July (though it overestimates its magnitude), in contrast to CM2.1 which exhibits its summer peak in June, as mentioned before. However, both models indicate that the peak persists from winter to summer, which is in contrast to observations. The slight underestimation of the CLLJ in AM2.1 during summer and fall is consistent with Martin and Schumacher (2011) and Diro et al. (2012) suggesting an underestimation in uncoupled models during these seasons. However, this general bias in uncoupled models is absent in AM2.5 with accurate simulation of magnitude of the CLLJ during summer and fall. The lack of vertical deepening in AM2.1 and CM2.1 is similar to the issue in the atmospheric model used in Amador (2008). The issue with lack of minimum in May in coupled and uncoupled models leading to lack of semiannual cycle, as noted by Martin and Schumacher (2011), is yet to be resolved in GFDL models. Further, both versions of the coupled and uncoupled models fail to simulate the minimum in May and hence the CLLJ in these GFDL models is characterized by an absence of semiannual cycle. This seems to be a persistent problem with most of AR4 models also (Martin and Schumacher 2011; Ryu and Hayhoe 2014). We explored the possible causes for deficiency of the GFDL model in simulating the spring minimum. The lack of minimum of the low-level jet during spring may be attributed to the northeastward excursion of NASH. The FLOR model has southwestward extension of NASH compared to observations in May as evident in the climatological SLP (figure not shown). This may lead to stronger SLP gradients in the Caribbean in FLOR and hence the stronger CLLJ and the lack of minimum in May. FLOR-FA, which is a flux-adjusted version of FLOR with SSTs close to observational estimates, also shows similar behavior (figure not shown), even though the model has better simulation of SSTs, which points again towards possible deficiency in the atmospheric model. FLOR AGCM forced with observed SSTs also hints towards a similar hypothesis, where correcting SSTs seems to not necessarily improve the simulation of CLLJ during May (figure not shown). It also suggests stronger SLP gradients during May along with stronger CLLJ. However, correcting SSTs does improve the simulation of magnitude of the CLLJ during summer and fall. Other coupled model [for e.g., National Center for Atmospheric Research (NCAR) Community Climate System Model Version 4 (CCSM4)] studies also showed similar results (Grodsky et al. 2012) and their AGCM runs with prescribed SSTs from observations did not correct the bias in SLP. However, improvements in the convection scheme in their atmospheric model reduced the biases to a certain extent. This lack of simulation of mean state during spring may have implications for teleconnections associated with the CLLJ. For example, the variations in the CLLJ have been connected to the variability of tornado activity in the southern US during spring. This may also have implications for bimodal distribution of rainfall over the Caribbean region which has peak rainfall during May. Stronger than observed CLLJ may lead to reduced rainfall during this month and may have adverse implications for forecasting rainfall during spring over the Caribbean. Hereafter, we analyze the simulation of the CLLJ and its teleconnection for JAS season as the models successfully simulate the CLLJ during this season; this is attributed to a fair representation of the meridional SST gradient and the involved mechanisms as described in the Introduction. These months are also of interest due to the effect of the CLLJ on the US rainfall over the central and southeastern regions (Weaver et al. 2009) and on the tropical storms and Atlantic hurricanes (Wang and Lee 2007b). We analyzed the spatial structure of the CLLJ in the longitude-latitude domain in JAS. Both the coupled and uncoupled versions 2.1 and 2.5 models show realistic simulation of the climatological structure of the CLLJ (Fig. 2), although FLOR shows slightly higher magnitude. Figure 3 shows that AM2.1, AM2.5, CM2.1 and FLOR models have realistic simulation of the JAS variability of CLLJ in the Caribbean region, with AM2.5 and FLOR showing a slight improvement in the longitudinal extent and strength of the jet. In addition to the improvements locally, FLOR also shows improvement in the simulation of the easterlies extending into the eastern Pacific. This improvement may be related to better simulation of SLP gradients (figure not shown) and SST gradients in FLOR (Fig. 4e). Both, the coupled and uncoupled models have realistic representation of CLLJ-related SST teleconnection patterns (Fig. 4). CLLJ-related SSTs shows westward extension of SST in CM2.1 in the western tropical Pacific and the magnitude of SSTs are slightly higher in the tropical Atlantic. However, these biases are improved in FLOR, which has better representation of CLLJ-related SSTs in the tropical Pacific and Atlantic Oceans compared to observations. Thus, the FLOR model has improved simulation of the observed relationship of the CLLJ with the tropical Pacific and Atlantic SSTs (Fig. 4e) which might translate into better SST gradients between the tropical Pacific and tropical Atlantic. The SST gradients further influence the CLLJ (Amador 2008; Krishnamurthy et al. 2015). The strength of regression coefficients is slightly higher in coupled models. This may be attributed to increased strength of amplitude of ENSO in CM2.1 and FLOR (Fig. 5). Weaker amplitude of the CLLJ may also be the contributing factor in FLOR in addition to stronger ENSO (Fig. 6e). We also notice slightly higher regression values in AMIP runs, which may be related to slightly weaker amplitude of the CLLJ (Fig. 6b, c). Above results are based on the comparison with MERRA, uncertainties in the reanalysis product will affect our conclusions. The CLLJ affects rainfall in the Caribbean region and beyond, over the United States and the tropical Pacific Ocean. The regression of rainfall over CLLJ is shown in Fig. 7 to examine the model’s ability to capture such teleconnections. The observed relation suggests reduced rainfall associated with a stronger CLLJ in the Caribbean region, Central America and northern South America, while enhanced rainfall over the southeastern US and the tropical Pacific (Fig. 7a). The reduced rainfall is related to lack of moisture in the jet entrance region and large-scale dynamics of the jet in the Caribbean and Central America, while enhanced rainfall in the jet exit region in the tropical Pacific due to moisture transported by the CLLJ. AM2.1 and CM2.1 fairly capture the observed relation but the magnitude of rainfall anomalies are lower in the Caribbean and Central America (Fig. 7b, d). FLOR and AM2.5 also have a realistic simulation of the observed relation, with improvements in teleconnections over the Caribbean and oceanic regions (Fig. 7c, e). From Sect. 3.1, we notice that the CLLJ has significant impact on the rainfall over the IAS. Both the coupled and uncoupled versions of 2.1 and 2.5 have realistic simulation of CLLJ and its teleconnections with SST and rainfall with FLOR showing slight improvements than its counterparts. Thus, we make use of hindcasts from coupled and uncoupled versions of 2.1 and 2.5 to explore the forecast skill of rainfall over the IAS during JAS, with hindcasts initialized in June. We also highlight the role of coupling and resolution in predicting the rainfall over the IAS. First, we show timeseries of the CLLJ in CM2.1 and FLOR forecasts and compare with observations. As seen in Fig. 8, both CM2.1 and FLOR forecasts capture the time variations of the CLLJ with correlation of 0.84 for each model with observations. The coupled model forecasts tend to capture the peak CLLJ events especially when accompanied with ENSO events; for example, a weaker CLLJ event during 1982, 1987, 1997 and 2009 is accompanied by an El Niño event and a La Niña accompanies a stronger CLLJ event during 2010. We also compare the rainfall indices from CM2.1 and FLOR forecasts over North America, Central America, Caribbean and South America to observations (the domain over which area-averaged rainfall is calculated is shown in Fig. 9). Both the models tend to forecast rainfall better over Central America, Caribbean and northern South America than over North America (Fig. 10). Further, we apply MOS to forecasts to correct for systematic errors and compare with raw forecasts to investigate its effect in improving the forecast skill. In this analysis, the predictand is always observed rainfall. In addition to coupled models, we have computed the forecast skill in two perfect-prognosis experiments, AM2.1 and AM2.5, as it helps us to estimate the upper limit of predictability. These simulations are called “perfect prognosis”, because the atmospheric model is forced with observed SST as in a typical AMIP experiment (Gates et al. 1999). These are frequently considered in the literature to provide a measure of the upper limit of predictability (see Barnston and Ropelewski 1992; Wilks 2006; Barnston et al. 2012; Muñoz et al. 2016 and references therein). As indicated in the methodology, we selected the Kendall’s tau correlation coefficient as an overall measure of model performance, using a 5-years-out cross-validated window (Table 1). Initially, we analyze the model output without any kind of statistical correction in uncoupled and coupled versions of 2.1 and 2.5 to understand the effect of biases on the model performance. The forecast skill calculated based on raw data with rainfall as predictor suggests that AM2.1 has considerably higher skill than AM2.5. However, there is no dramatic difference between the hindcasts produced by CM2.1 and FLOR (Table 1). This result is consistent with Fig. 5e, f in Jia et al. (2015) for the JAS season, although for a global domain. Further we apply statistical correction using Canonical Correlation Analysis on the raw model output, and then calculate the forecast skill using both modeled rainfall and SST as predictors. We computed the cross-validated skill using the model’s precipitation (PRCP) and SST as independent predictors. Overall, the forecast skill is notably enhanced in all models when raw model output is corrected based on MOS approach (Table 1). AMIP models, AM2.1 and AM2.5, show higher skill with model rainfall as predictor based on MOS-corrected data compared to raw rainfall data as predictor. Coupled models also show a dramatic improvement with respect to the raw model output, but there is no outstanding difference in rainfall skill when comparing the results between the two MOS-corrected experiments. We also examined the spatial distribution in skill (Fig. 11). Spatial correlation skill with rainfall as predictor appears to be better in AM2.1 compared to AM2.5 in most of the Intra-Americas region, and is comparable between CM2.1 and FLOR, consistent with Table 1. In general, the skill is improved only over South America in CM2.1 and FLOR, and over both South and North America in AM2.5. Nonetheless, AM2.1 exhibits lower skill over parts of Honduras and Nicaragua, northern Colombia and western Venezuela after MOS has been applied. Hence, forecasts with rainfall as predictor show overall better skill in the entire domain after MOS correction is applied compared to the raw model output, but certain regions experience a decrease in skill (Fig. 11). With SST as predictor, improvements in skill is mostly over northern South America in AM2.5 and FLOR, and over both North and South American countries in the domain of study for CM2.1. Further, we investigate the role of coupling (Fig. 12) and horizontal resolution (Fig. 13) in the improvement of skill over IAS before and after MOS correction. Coupled models tend to show improvement in skill over South America after MOS correction relative to uncoupled models with both rainfall and SST as predictor (Fig. 12b, c, e, f). However, neither rainfall or SST as predictor shows any considerable enhancement in skill between coupled and uncoupled models over North America, except moderate improvement in CM2.1 compared to AM2.1 with SST as predictor. Figure 13 highlights the role of resolution on forecast skill. High-resolution raw predictions for rainfall tend to show improved skill compared to low-resolution models over Mexico, Northern Venezuela and Western Cuba with rainfall as predictor (Fig. 13). However, experiments with higher horizontal resolution tend to provide lower skill in the uncorrected hindcasts, especially in Colombia and Venezuela (Fig. 13a, d). After MOS correction has been applied to the dynamically forecast rainfall, the role of resolution is less clear and it depends on the location of interest (Fig. 13b, e). Although uncoupled models show improvement in skill over Northern Mexico, Guatemala and Florida, resolution is of little or no relevance for the MOS experiments based on dynamically forecast SST fields, especially when considering FLOR and CM2.1 (Fig. 13c, f). This may be related to having the same ocean resolution in both CM2.1 and FLOR. Thus, improving the atmospheric resolution in coupled models with same lower resolution ocean models does not improve skill in SST-corrected MOS experiments. Further research is needed in order to explore this issue. The IAS encompasses the Caribbean Sea and its island nations, the Gulf of Mexico in addition to surrounding land regions, such as southern United States, Mexico, Central America, and northern South America. The CLLJ is considered an integral part of IAS climate system, due its large influence on weather and climate in the region by acting as an important moisture corridor to the surrounding oceanic and continental regions. IPCC AR4 multimodel studies suggest that the state-of-the-art coarse resolution coupled models fail to simulate the magnitude of the CLLJ and its teleconnections, which warrant high-resolution coupled models. In this study we used high-resolution coupled and uncoupled models to analyze the simulation of the CLLJ and its teleconnections and further compare them with low-resolution coupled and uncoupled models. Considering that the CLLJ has pronounced impact on the rainfall variability over the IAS, we also analyzed the forecast skill of rainfall over this region in both coupled and uncoupled models with high and low-resolution. Observed CLLJ shows two peaks in summer and winter, with maximum wind speed in July and associated vertical deepening. CM2.1 erroneously peaks in June; however, FLOR successfully captures the summer peak with vertical deepening of the jet. The jet is better represented in uncoupled simulations forced with observed SSTs (AM2.1 and AM2.5) compared to their coupled counterparts, emphasizing the role of SSTs and their gradients in the simulation of the CLLJ. We focus on the JAS season to explore the simulation of jet and the associated teleconnections in addition to the forecast skill of rainfall, as the CLLJ contributes to the variability of rainfall over US and to the tropical storms and hurricanes during JAS. The high and low-resolution versions of coupled and uncoupled models have realistic simulation of the variability of the CLLJ for the JAS season. FLOR and AM2.5 show slightly improved simulation compared to their low-resolution counterparts; this is attributed to better simulation of SST and SLP gradients which influence the variability of the CLLJ. A stronger CLLJ leads to reduced rainfall in the jet entrance region over the Caribbean region, Central and northern South America, due to lack of moisture and enhanced rainfall over the southeastern US and the tropical Pacific due to abundance of moisture transported by the CLLJ in the jet exit region. FLOR and AM2.5 show slightly improved simulation of CLLJ-related rainfall compared to CM2.1 and AM2.1 especially over the Caribbean and ocean regions. Further, we analyzed the forecast skill of rainfall in the IAS during JAS using hindcasts initialized in June. The forecast skill in the model is measured in terms of Kendall’s tau correlation coefficient. In this study, we highlighted the role of applying statistical correction to account for model biases, coupling and resolution in predicting the rainfall over the IAS. The raw model forecasts without any statistical correction suggests that there is no dramatic difference in skill between the CM2.1 and FLOR. But uncoupled models indicate considerable difference in skill, with AM2.1 showing higher skill than AM2.5. After applying MOS to correct for model biases, we determined the forecast skill in predicting rainfall using both rainfall and SST as predictors. After MOS correction, we notice a dramatic improvement in forecast skill in all models, AM2.1, AM2.5, CM2.1 and FLOR. There is no striking difference in forecast skill with rainfall as predictor versus SST as predictor. However, the spatial distribution in skill suggests that the improvement in skill from raw forecasts to bias-corrected forecasts is region dependent. For example, with rainfall as predictor, AM2.5, CM2.1 and FLOR show better skill over North and South America after MOS correction, but AM2.1 has lower skill over parts of Honduras and Nicaragua, northern Colombia and western Venezuela. Improvements in forecast skill is also dependent on certain regions with SST as predictor with higher skill mostly over northern South America in AM2.5 and FLOR, and over both North and South American countries in the domain of study for CM2.1. Other studies have also shown useful skill in North American rainfall during JASO season (Misra and Li 2014; Misra et al. 2014; Misra and Chan 2009). In addition to analyzing the sensitivity of forecast skill to bias correction, we also determine the effect of coupling and horizontal resolution in predicting the rainfall over the IAS. Forecast skill is sensitive to coupling only over South America in bias corrected forecasts with both rainfall and SST predictors. We do not see any improvements in skill over North America between uncoupled and coupled models except with moderate improvement in CM2.1 compared to AM2.1, when using forecast SST as predictor. Forecast skill is not sensitive to resolution, especially in the coupled models, CM2.1 and FLOR, using SST as predictor. This may be attributed to the same ocean resolution in both models, thus suggesting that coupled models with improved atmospheric resolution but with the same lower resolution in ocean may not contribute to better forecasts. However, uncoupled models do show higher skill with high-resolution atmosphere compared to those with low-resolution atmosphere. The IAS region is heavily populated with high vulnerability to changes in rainfall variability (IASCLIP 2005). In most of Central America, the Caribbean and northwestern South America, JAS is a transition season between the two rainfall peaks. Having predictability for this season is key because soil moisture content and state of vegetation tend to enhance or decrease the intensity of impacts associated with droughts or floods during the second rainfall peak. This also has important repercussions for food security, water management, disaster planning and even epidemic preparedness in those highly vulnerable nations. Thus, it is important to improve our ability to predict rainfall over the region. In this study, we performed a comprehensive analysis of forecast skill with and without bias correction. We also compared the skill among coupled and uncoupled models, and sensitivity to improvements in atmospheric resolution. In present times, where most of the resources are invested in coupled models and improving resolution, this study provides insights on sensitivity of forecast skill to coupling and resolution, which may help plan future efforts in model development. This spatial average is calculated using the Observatory’s seasonal forecast system, that involves the entire Latin America and the Caribbean. Hence, it is not directly comparable with the values corresponding to only the Intra-Americas region. Nonetheless, the range provided offers an idea of typical forecast skill for rainfall. Several studies (Glahn and Lowry 1972; Wilks 2006; Vannitsem and Nicolis 2008) have shown that 30 years of data is sufficient to constrain the MOS fit. We would like to thank Xiaosong Yang and Liping Zhang for helpful comments on the manuscript. We also thank three anonymous reviewers for their valuable input. This work is supported by MAPP Intra Americas Seas proposal funded by NOAA Climate Program Office and National Science Foundation (award number 1262099).